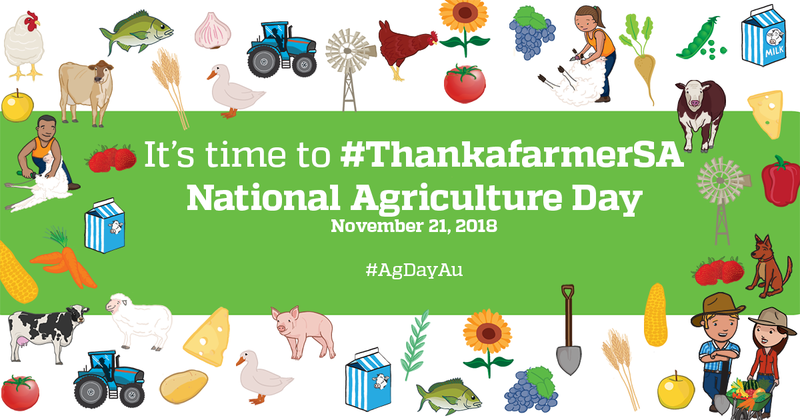 Get ready to thank a farmer and show your appreciation for their hard work in producing food and fibre for us. 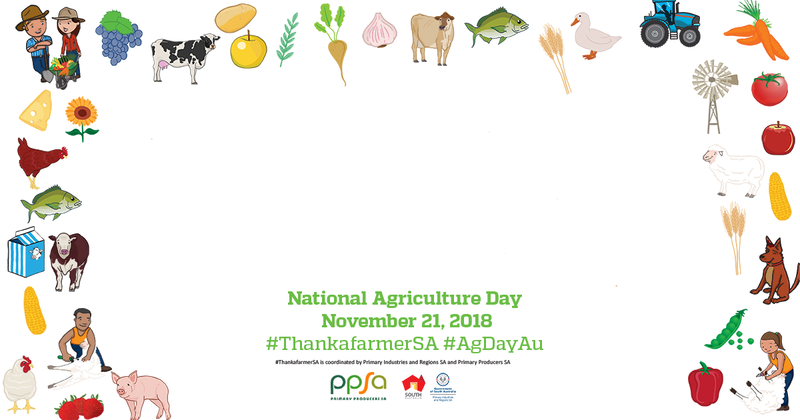 Wednesday, 21 November is National Agriculture Day, and we want you to join us and Primary Producers SA in celebrating our primary industry sectors. It is more important than ever to buy local and support our primary producers, given the drought impacting parts of regional South Australia. 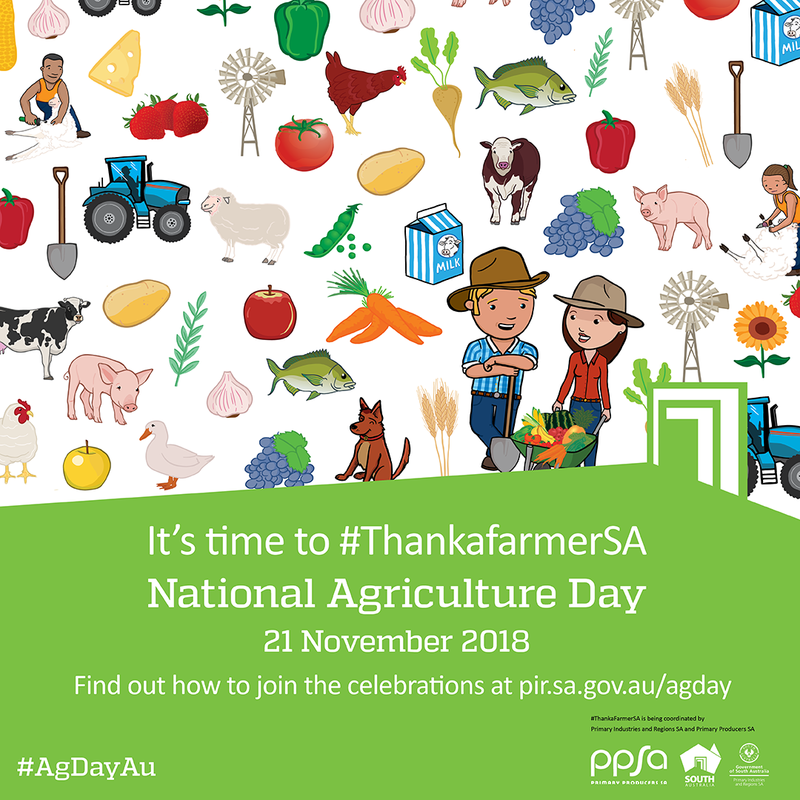 Help us celebrate our farmers, our fishers, our producers, and all the related businesses and organisations who help feed, clothe and grow our social and economic wellbeing across South Australia and the nation. Get informed: Check out PIRSA's fact sheets, videos and education resources all about SA's primary industries below. 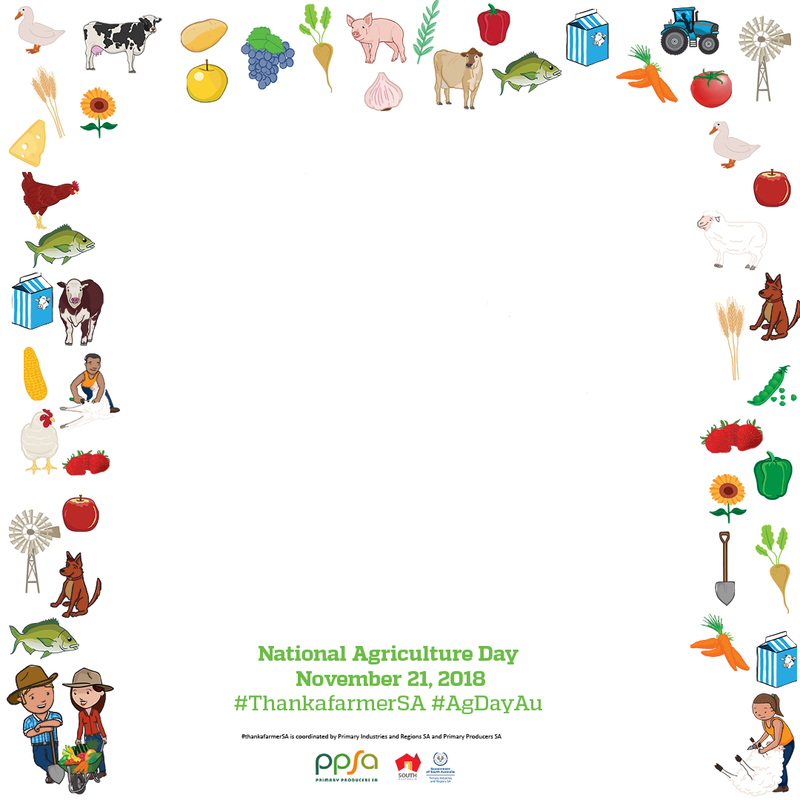 Choose SA: Shop and eat local and show your support for our state's farmers by buying local food and beverages at your local supermarket, farmers market, buy direct or eat at a local restaurant. 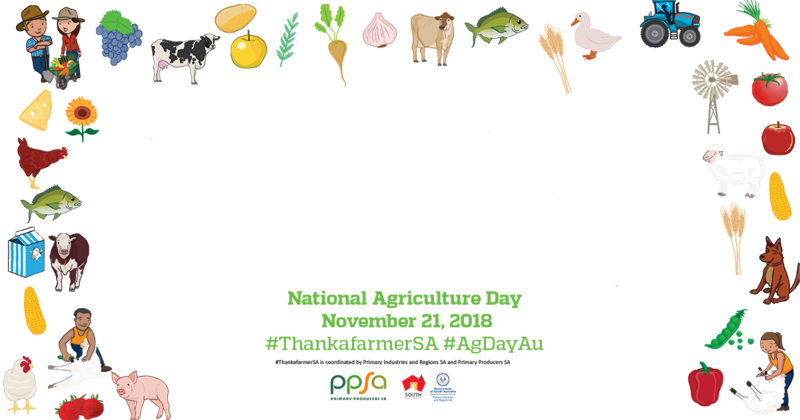 Go fish: Don't forget we're celebrating all our primary industries, which includes our fishing and aquaculture industries. You can even use #ThankafisherSA to show them you appreciate their hard work and enjoy their fresh catch! Visit regional SA: Travel to regional SA and support our regional and rural communities, where our primary industries thrive. Pork it: make sure you buy Australian grown pork – check the country of origin labelling. Drive safely: Remember it's the season when slow moving machinery are on our country roads, so be patient. South Australia's agriculture, food, wine and forestry industries are a vital part of the state's economy – they form our largest export sector and are a major employer. Our agriculture, food and wine industries are major employers for South Australians. So whenever you choose SA you are helping keep jobs in our state. In 2016-17, the agriculture, food, wine, and forestry industries generated about $22.5 billion in revenue. These industries also accounted for 57% of the state's merchandise exports. 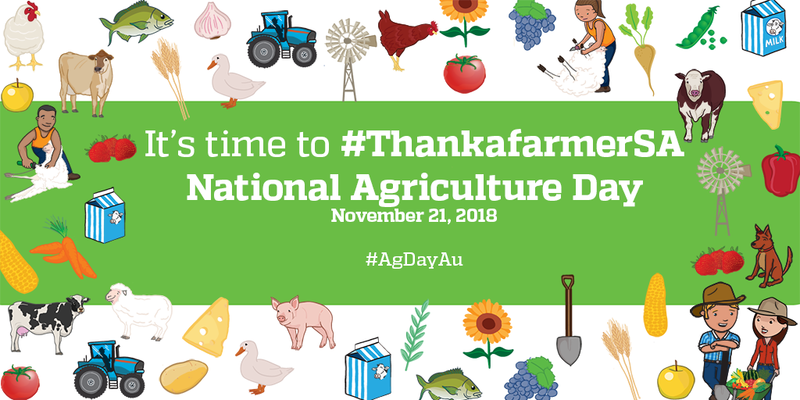 Below you will find ideas and resources to help show your appreciation and learn more about our South Australian farming sector. You may recognise South Australia's most famous farmers, George the Farmer and Dr Ruby (and some of their friends) in our images and posters below. 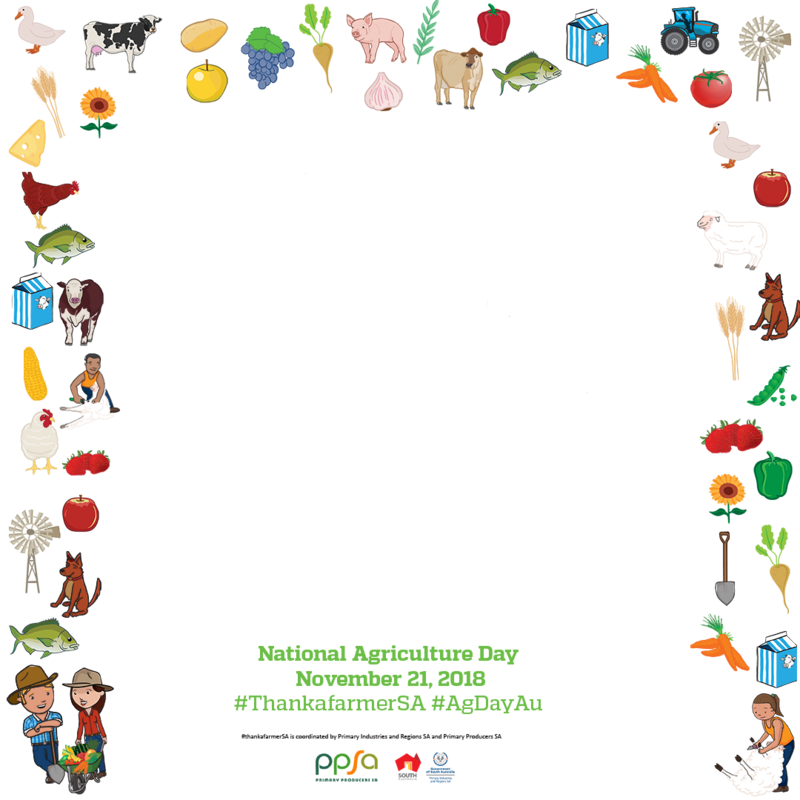 George is a National Agriculture Day Ambassador, and their creators Simone Kain and Ben Hood very kindly provided the illustrations for the design of our inaugural artwork for #ThankafarmerSA. Be sure to check out George's new song and school resources, created just for this occasion on the George the Farmer website. Find free Australian school curriculum-aligned teachers' guides, as well as individual printables and fun activity ideas that can be created at home or in the classroom at George the Farmer website. Check out Primezone, which provides teachers with single-point access to a range of primary industries education resources. Check out Grain Producer SA's magazine Grain Producer, which profiles the professional and innovative people behind the state's valuable grain growing industry. The Food & Fibre Education SA (FFESA) is a fantastic education and outreach program engaging students, teachers, careers advisers and the general community in agricultural (food and fibre) science, technology, engineering and mathematics (STEM). FFESA is working in schools (from Year 5 to 12) and with thousands of students to inspire and engage in agriculture learning.